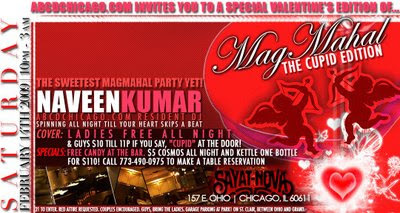 DJ NAVEEN KUMAR spins Bollywood, Bhangra, Top 40 and Hip-Hop all nite! Specials: Free candy at the bar. Cosmos $5 all night. $110 Bottles of Ketel One! Cover: Ladies Comp'd all night and Guys $10 till 11p with password, ''CUPID''. 21 to enter. Reduced parking at PARK1 garage on St. Clair between Ohio & Grand. Call Hamed at 773-490-0975 for table reservations.